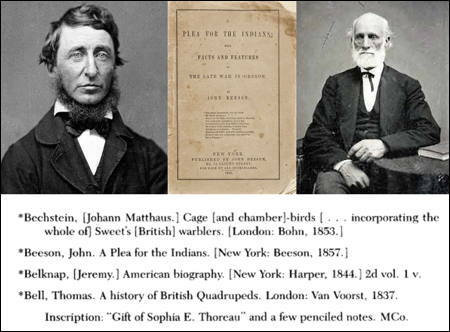 So Henry David Thoreau (left) read John Beeson (right), and he had a first edition of his book! Beeson was our first human rights activist here in Oregon. He wrote of his insights and experiences of the Rogue River War in his 1857 book, A Plea for the Indians; with Facts and Features of the Late War in Oregon. The list is from a checklist of books in Thoreau's personal library. An asterisk (*) indicates that Thoreau included the title in his own catalogue. Beeson met with quite a few folks when he was on the east coast, including Lincoln and Emerson, and now I'm thinking, most likely Thoreau.